SALVAGED FABRIC set the tone for Cameron Taylor-Brown and Carrie Burckle works in the upcoming show. 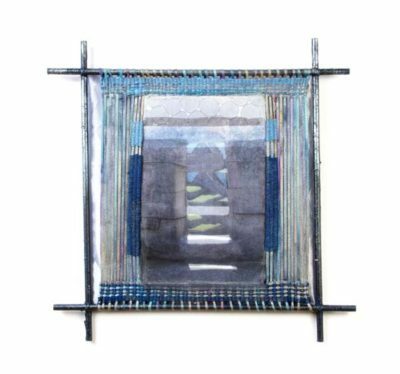 Ancient stones in the Peruvian Highlands and a contemporary fabric swatch inspired Cameron Taylor-Brown’s new fiber art quartet. The champagne-colored polyester swatch named “Majestic Stone” also describes the ruins and the centuries-old stonework she saw on her recent travels. “I enjoy that ‘majestic’ describes both the fabric and stonework… and that repurposing is integral to both,” Cameron writes in her artist statement for an upcoming show. She is one of 17 artists featured in “Diverted Destruction 8-Unraveled: the Fabric Edition,” opening at The Loft at Liz’s Art Gallery on June 27 in conjunction with California Fibers. The gallery, at 453 N. La Brea, is neighbored by upholstery, fabric and design stores, so gathering discarded fabric samples for her eighth annual salvage and recycle-themed exhibit was a natural for gallery owner Liz Gordon, Cameron said last month. 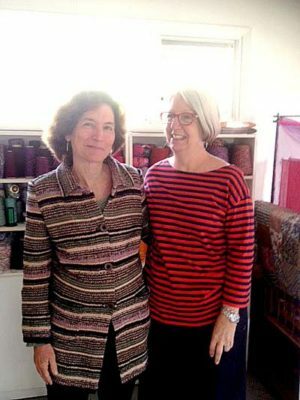 Working in her home studio on S. Mansfield Blvd., the artist and teacher found the fabric book from among two car loads of silks, linen and other sample books Liz collected for the show. Each artist was charged with making two works; one will be chosen for the curated show. “I did four because I couldn’t help myself,” smiles Cameron, who has learned about textiles and cultures in travels from Bhutan and India to Pantagonia. The new works are small, coffee-table size, which, while they share a common theme, stand alone. In one, an image of an indigenous woman walks on what looks like a cobbled stone street, but is the fabric swatch pattern. Other photos also taken by Cameron and printed on fabric show ruins and the sacred site of Machu Picchu. “Leftover” yarn, embroidery and scraps from previous projects were woven into each piece. Fellow artist Carrie Burckle, Windsor Village, was drawn to the floral patterns she found on a linen sample for her work, “‘Re Bloom’… a metaphor for reinvention and repurposing, bringing new life to what was to be discarded,” she writes. “Screen-printing an image of hand-drawn lines created a layer of mystery and softness to the surface,” said Burckle. Working in her downtown studio, the 21” wide x 34” long study in pink was dyed, screen-printed and embroidered. The color “represents vulnerability, femininity,” adds Burckle, who teaches at Cal State Long Beach. Artists from the exhibit will facilitate an adult workshop Sat., July 11 from 2 to 5 p.m. A family workshop is Sat., July 18 from 2 to 5 p.m. Both free. Visit theloftatlizs.com/upcoming-events. An opening reception is on Sat., June 27 from 7 to 10 p.m. at The Loft at Liz’s, 453 S. La Brea Ave. The exhibit, “Diverted Destruction 8-Unraveled: the Fabric Edition,” continues through Sept. 8.